Cathy's Cowl needed a matching hat (That's my best friend in the picture. Ain't she cute?). 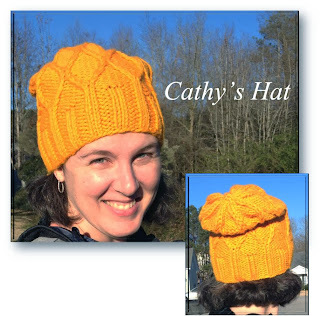 To thank you for purchasing the "Cathy's Cowl" pattern, I am giving this matching hat pattern to you for FREE! 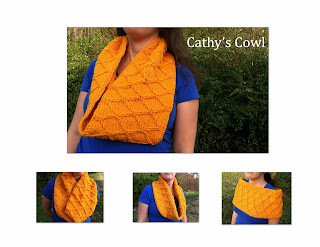 It will only be offered to those who purchase the cowl pattern. For those who have previously purchased the cowl pattern, I have sent an updated file including the hat pattern to the email addresses listed on the PayPal receipts. If you have not received yours, please do not hesitate to contact me via the link in the left sidebar. There is a correction to the cowl pattern. In the note about reading charts for knitting in the round, I wrote that you're supposed to read the chart rows from left to right. It is supposed to read "...from right to left." The correction has been made in the updated version. I know how frustrating errata can be, so I truly apologize. As a reminder, the sale for the cowl pattern is ending on December 26, 2013. Finished Size: 9" X 38"
Yarn: Brown Sheep Nature Spun Chunky, in "Goldenrod"
PayPal, credit, or debit cards accepted. The PDF file will be delivered upon payment.